In 1952, India was the first country in the world to launch a national programme, emphasizing family planning to the extent necessary for reducing birth rates to stabilize the population at a level consistent with the requirement of national economy.We two, ours two ("Hum do, hamare do" in Hindi) is a slogan meaning one family, two children and is intended to reinforce the message of family planning thereby aiding population control. All forms of modern mass communication media plus traditional cultural media were used to develop social support for the idea of the small family. After 1952, sharp declines in death rates were, however, not accompanied by a similar drop in birth rates. The National Health Policy, 1983 stated that replacement levels of total fertility rate (TFR) should be achieved by the year 2000. In general, direct efforts on the part of government to promote family planning have had only limited success in India. In large part this has been due to the factors which have traditionally operated in Indian culture and society to promote large families. Initial policies which formed clinics expecting that the people would come out on their own failed due to deep rooted tradition and the need of people for the labor. It was in the 1960’s where the mode of population policies had changed from clinics to home visits by family planning workers to bring awareness among people. Despite these efforts the population of India continued to grow at an alarming rate which led to the establishments of infamous sterilization camps in 1976-77 but the political situation of the country along with the widespread negative publicity made the government to suspend the sterilization program. Here, however, it might be noted that the most common family planning modes have proven difficult to implement under Indian conditions. Where government efforts are concerned, only three methods are advocated: sterilization (vasectomy for fathers and tubectomy for mothers), IUDs and condoms. Sterilization has traditionally met with strong resistance among uneducated sectors of the population who associate it with loss of femininity As it is often irrevocable, it has been a source of concern in a society where couples who may already have several children risk losing some or all of them as a result of such factors as epidemics, earthquakes or floods. In regard to IUD, which has been promoted since its introduction in India in 1963, the method has not proven popular because of the relative frequency of excessive bleeding and involuntary expulsion (which is less frequent). Taking note of the fact that in traditional Indian society gynecology, obstetrics and other fields requiring intimate contact and conversation with women are invariably reserved to female doctors only, the real problem is the lack of sufficient numbers of dedicated women physicians who are willing to work in rural areas and spend some time in pre-insertion and post-insertion follow-up of their patients. The third major mode of contraception-condom use has seen a marked increase in usage in India in recent years; however, much of this increase has been due less to family planning concerns but to fear of AIDS. Government is offering incentives for families accepted for sterilization. Facilities offered by government to its employees are limited to two children only. Only those with two or fewer children are eligible for election to a Gram Panchayat or local government. To fulfill the unmet need for the contraception, strengthening the health infrastructure, and integrating services for reproductive and child health. Effective implementation of inter sector strategies so as to reduce the TFR of India by 2010. To sustain economic growth, Social development, Eco conservation and stabilize the population by 2045. 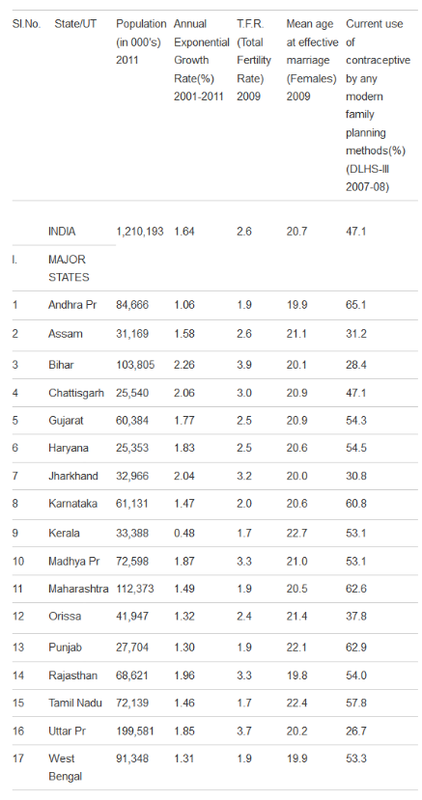 Though India has set a target of 2.1 for TFR by 2010 we are still at a national average of 2.6 and 12 states have already reached the target of 2.1. A new initiative had been launched in 2010 in which contraceptives will be delivered door to door by community health workers and substantial amount of $12 billion had already been spent over the past 7 years by our government for improving health infrastructure. I want to know that from when the policy of"we two ours two" started?